Our first destination of the day tour in Gangtok was the most awaited Rumtek Monastery, also called the Dharma chakra center. Located 24 Kms away from the city, it is the nub of all attractions in Gangtok. A huge green board greets you as you enter, informing you about the history of the place. It was built by the supreme head of Kagyu sect of Tibetan Buddhism (His holiness the 16th Gyalwa Karmapa Rangjung Ringpe Dorje) during the 1960s. It is the International headquarters of the Karma Kagyu sect and the main seat of his holiness in exile. A short climb uphill from the main gate along a wall adorned with an array of prayer wheels leads you to the entrance of the monastery. 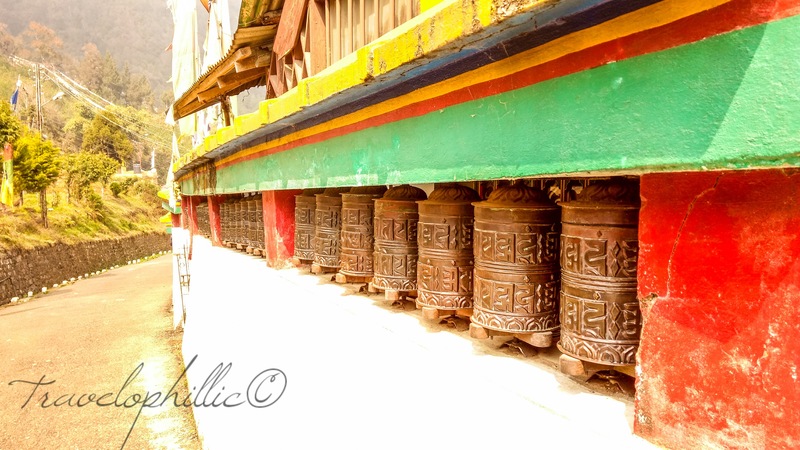 As we walked up, gently turning the neatly assembled prayer wheels, we heard a voice from behind us “It is supposed to be turned in the clockwise direction and not the other way round, it brings you good charm”. He was a tour guide accompanying an old American couple. We learnt some old adage from him regarding Buddhist prayer flags, about how they are kept in motion naturally by the wind which symbolizes emancipating the prayers into the universe for the betterment of mankind. There’s something about gathering information from the locals as opposed to the grim Wikipedia search that anyone can easily do today. We thanked him and moved on. We stopped at one of the few Tibetan trinket stores on our way up where we were welcomed with a smile, to buy a miniature prayer flag as a souvenir to take back home. As you enter the monastery, you cannot miss the distinctive tranquility that overpowers you. A tall pillar standing in the center is surrounded by rooms for monks on either side which is connected by the main shrine in the front. The walls and ceiling of the main shrine is veiled with murals of deities filled with a blend of perky dazzling colors and has a large red wooden door. Photography is prohibited once you enter where there are rows of seats placed, leading up to the main idol. We saw a monk so engrossed in meditation; he was perhaps only present physically in that room. Standing at the other end was a sizeable idol of Buddha and on either side there were small windows with elegantly arranged smaller idols of Buddha that were more than 800 in number. It was undoubtedly both the symmetry and manifoldness that made it so magnificent. As we entered the golden stupa, located behind the monastery, we could already hear harmonious playing of instruments with intermittent pulsating thumps. We were told it was part of the ritualistic worship of idols, where they alternately chanted several Buddhist prayers. We intently watched the priest as he sat down to play instruments with the rest and sporadically got up to open the glass door at the other end of the room to light lamps or place paraphernalia ritualistically. It is rather a mystical and peaceful experience despite the occasional kerfuffle caused by travelers. It is inevitable for anyone visiting the place to wish to stay longer, but time isn’t always on our side!